Charles Dickens knew spring well. He wrote, in Great Expectations "It was one of those March days when the sun shines hot and the wind blows cold; when it is summer in the light and winter in the shade." This was our weekend. Beautiful sunshine, but chilly air and when it blew, a biting wind. In the grounds of Government House all kinds of flowers are blooming in clumps and beds among the pathways and rocks. My camera worked overtime, finding colour and texture everywhere. The sun played peek-a-boo, but when it shone, how the light glowed among the petals. Not all is in bloom. The stark architecture of Garry Oaks reminds me that spring unfolds gradually. Hellebores bloomed prolifically in the Lieutenant Governor's garden. I met her, Judith Guichon, walking with her dog, and we exchanged a smiling hello. Warm yellow beehives stand off the beaten path. I studied them for a few moments and was happy to see a goodly number of bees flying about. Today, Sunday, was warm and sunny. We switched to Daylight Savings Time last night. I think the combination of the mellow sunshine and the time change had us feeling a wee bit tired. Family came for Sunday supper and our children confessed to the same feelings. I'm not a fan of the time switch - choose one or the other and stick with it is my opinion. 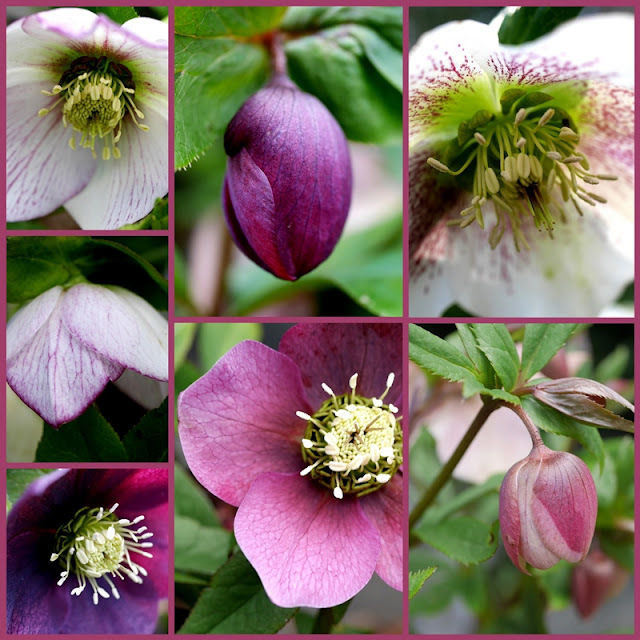 So many varieties of hellebores, and all of them beautiful. I've not had much success in keeping my plants alive and wonder what I'm doing wrong. Too dry in the summer? I'll be doing some research. I'll be away from my blog for a few weeks, chaperoning a group of Grade 12 students who are going to a needy area in Mexico for a service project. We leave early Wednesday morning, in time to catch the first ferry at 7 am. By the time I return, I expect more spring growth to have burst out. 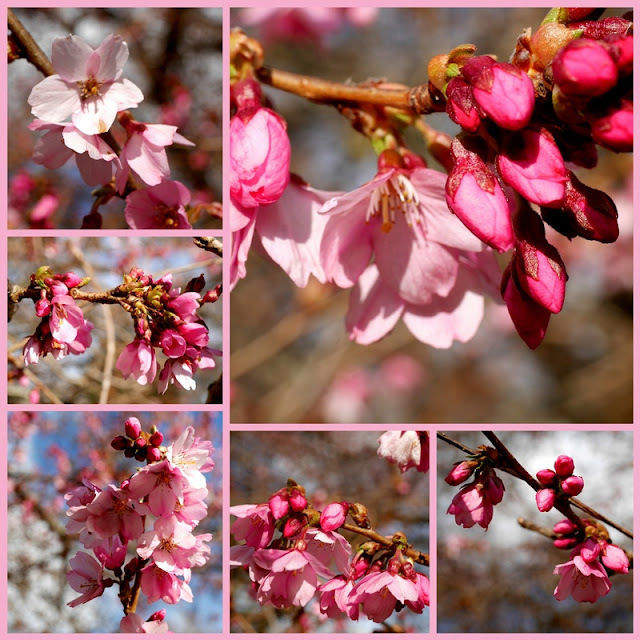 Stunning spring flower images Lorrie - take care, and have a great time in Mexico - it sounds as if you will be having an interesting time. Thank you, Rosemary. It's sure to be interesting with 34 students! Beautiful flowers. My hellebores are not quite as good as they were last year, maybe it's the weather? I hope your trip is full of interesting experiences. Stay safe. Sounds like a wonderful spring to me already. Sounds as if you have a busy few weeks ahead. Looking forward to your return and the stories you’ll share. Lovely photos! I had 2 walks yesterday. Where are you going in Mexico? Have fun! Hello - we're going to Vicente Guerrero in Baja California - driving all the way (3 days). It's about an hour or two past Ensenada. I'm looking forward to using my Spanish again. Your pictures are beautiful. Enjoy your trip. It's so exciting to see plants blooming on the West Coast already. I particularly loved the gorgeous purple flowers. I'm not a big fan of the time change either, although I do appreciate the gain in sunlight. I think Saskatchewan is the only province that doesn't observe DST? Happy and safe travels to Mexico! Hi Lorrie, In the Fall I leave quite a few leaves around my Hellebores plants. They help shelter the delicate new leaves and flowers in below freezing weather and late snowstorms. Our high desert climate is quite severe yet my Hellebores have multiplied from only 2 plants, a few years ago, to hundreds to date. I have shared with many fellow gardeners. Our winters are quite mild so I'm not sure why they would have died off this year. I'm going to try mulching the next plants I get and see if I have better luck. Thanks for the tips! The Lieutenant Governors garden looks like a wonderful place for a stroll at any time of the year but seems exceptionally pretty in Spring. Beautiful mosaics, love the hellebores particularly. Have a wonderful trip to Mexico, stay safe and bring back lots of stories to show & tell. Such beauty all around. Have a wonderful week. Lorrie, The blooms have arrived in your area, the ones I found at still inside. The sun and longer days are evidence that spring is just around the corner. You captured some lovely color. Thanks for sharing. Have a great trip. Sylvia D.
Enjoy your trip...the grounds at Government House are so well kept by the many volunteers. I must get back there myself...and in the summer I like stopping at the tearoom for a bite to eat after walking the grounds...Mother used to love it there. We have had many sunny days here in SoCal and most times there is something in bloom, but I love seeing your flower photos. And, anytime I see a beehive it takes me back to my Grandmother's house. Enjoy your trip -- what a wonderful thing for HS students to do! And they have the perfect knowledgeable, fun chaperone, lucky them. Your spring flowers are just scrumptious -- they make me a bit homesick but at the same time I love seeing them. Our daughter has been messaging me pictures of each new flower that shows up in their yard and I can't get enough of them. I will keep you in prayer sweet Lorrie as you are in Mexico. I cannot wait to hear about your journey upon your return. Your camera (guided by you) is always up to the task of capturing stunning nature photos! Praying for you as you are away . . . I was drawn to the bench under the Garry Oaks ... even if it would mean bundling up a bit ... I can relate to your comments about the weather - same here in Montana - as long as you stay facing directly into the sun, you're fine! Buen viaje a Mexico! Gracias, Angie! The sunny weekend has dissolved into cooler temperatures and fine rain. Still, spring can't be too far away.